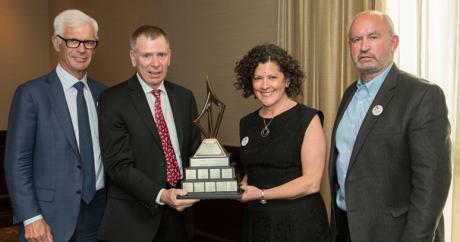 Mining Person of the Year award is presented as part of the B.C. Mining Week to publicly recognize an outstanding individual in recognition of his outstanding leadership in advancing and promoting the mining industry in British Columbia, MABC is pleased to recognize the many efforts of Robert G. Scott, Teck Resources. This year’s winner, Robert G. Scott, started as an engineer-in-training at Sullivan Mine in 1979 and has held progressively senior roles since. He served as the Vice President of Base Metals, North America, Gold, and Operating Excellence, before becoming Teck’s Senior Vice President of Zinc in 2012. His operational leadership was truly evident during the most recent industry downturn and in particular, in 2015. Under Rob’s guidance, Teck’s Trail Operations not only reduced their operating costs, but also set production records in zinc, silver and indium. Most importantly, he led his team to achieve these records while improving safety and sustainability.